We have 28 years of combined installer experience at Ultimate Window Tinting. When it comes to your home, you don’t have to bring it to us. We offer free in-home estimates. Vista window film is a micro-thin composition of polyester and metalized coatings, bonded by adhesives. If a window or glass door should break, the shattered glass tends to be contained within the Vista sheath. The film forms a protective shield across your windows. The film reduces 99.9% of the harmful UV rays, rejects up to 79% of solar heat, and reduces up to 87% of the sun’s glare. This will reduce fading of furniture, wood, carpet, and other valuables that are subject to fading. Along with improving comfort and offering significant energy savings, it is guaranteed dual pane safe. transferrable one time. It is guaranteed to not bubble, peel, blister, crack, change color, or delaminate for the life of your home. Vista, used and recommended by interior designers, is also recommended by the Skin Cancer Foundation. 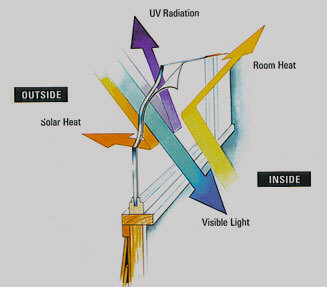 Solar control film, such as Vista, should not be confused with the automotive black tinting film. Colors include: virtually invisible, reflective silver, frost, bronze, and other colors. Vista is proud to be affiliated with and recommended by the following industry organizations: BOMA International, AIMCAL, International Window Film Association, Skin Cancer Foundation, Protecting People First Foundation, and ASID Industry Partner.